While some stars were making speeches on stage at the National Television Awards at London's O2 Arena, others were gossiping behind the scenes. That's when they weren't starring in open-mouthed disbelief at Jedward and Vanilla Ice's show-stealing routine. Here are some of the best anecdotes from the night, that you didn't see on TV. The Geordie duo revealed they were heading straight back to Manchester after the awards to continue filming the 2010 series of Britain's Got Talent. "We've had dancing horses, talented dogs and quite a few nutters, as well you might imagine," said Anthony McPartlin. "The horses weren't as talented as they thought they were," added Declan Donnelly. Ant: "They made an awful mess of the stage." 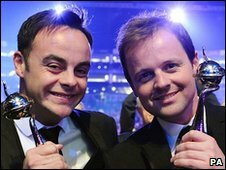 Dec: "Yes, we had a big horsey pooper scooper." They said they had finished filming in Glasgow and were set for three days filming in Manchester. "This is our favourite part of that show - going out and meeting the public," said Dec. "We're all really excited to be back and working on it again." 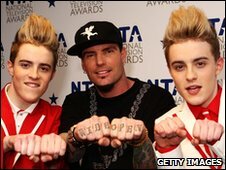 US rapper Vanilla Ice said he watched clips of X Factor's John and Edward Grimes on the internet before he agreed to join them on stage. "I think they're great - I didn't know much about them until a couple of weeks ago," he said. "I checked out YouTube and I went 'no way', and after I got over the laugh they invited me to come out." He added: "I said to these guys 'get in where you fit in' - don't listen to the critics." John (or Edward) said: "He's got a lot of great music, he's a great rapper and he's got a lot better since back in the day." To which Mr Ice responded: "I was young once." The X Factor judge, who has just announced she is expecting a baby, said she had developed a craving for sweets. "I've never, ever been after sweets, even as a child I didn't go for them," Minogue said. "No plans at this stage - apart from the birth and then we'll work it out after that." And she said Kylie would make a great auntie. "She will be shopping in every baby store in the entire world." 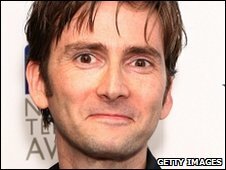 The ex-Doctor Who star said he was looking forward to watching Matt Smith as the new Doctor. "I can't wait. It'll be a bit weird at first but I think I'll get used to it quite quickly, because I can't miss it." Asked if he might appear in Coronation Street, when a former Doctor Who producer takes over the running of the soap in its 50th anniversary year, he said: "He hasn't asked - and I wait for the phone call..."
TV presenter Myleene Klass said she had received "incredible support" after the incident in which she waved a knife at youths who entered her back garden. "It has started people talking, but believe me - after how I felt - I'd rather it hadn't happened," the former pop star said. Asked if she'd consider becoming an MP, she replied: "No, because I like to get things done." Stars of the ITV1 soap suggested which classic characters they'd like to see come back for Corrie's 50th anniversary year. Katherine Kelly, who plays feisty Becky McDonald, said: "I'd love Suranne Jones (Karen McDonald) to come back but I think she's too busy, or Sarah Lancashire (Raquel Watts)." Meanwhile Craig Gazey, who won the most popular newcomer award for his character Graeme Proctor, made the inspired suggestion: "Reg Holdsworth." Meanwhile, EastEnders star Barbara Windsor said she had no idea how her character Peggy Mitchell would exit the BBC One soap later this year. "I don't know how I'm going because they don't ever let you know," she said. But Cheryl Fergison, who plays Heather Trott, had other ideas. "Barbara is a legend - she's not going to leave because I'm going to kidnap her in my dressing room so she can't leave the building."